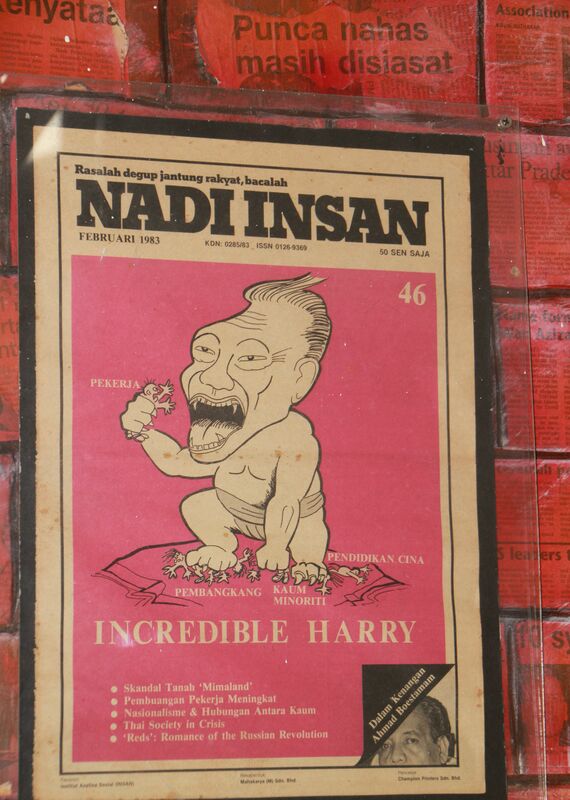 I have so many questions about this cartoon: Did LKY do something particularly nasty in late 1982 to provoke this cover? What exactly does the caricature represent? It seems like he’s wearing a sumo outfit, but with the face and fangs of one of those scary Indonesian monsters. Comments, thoughts much appreciated. Sumana, my best friend, and I visited Malaysiakini’s office in Sept 2011. We were there to interview Steven Gan, one of the co-founders of Malaysiakini, and probably one of the braver and more inspirational people I’ve met in Malaya. I write about Malaysiakini and Steven in some detail in Floating on a Malayan Breeze, my first book. 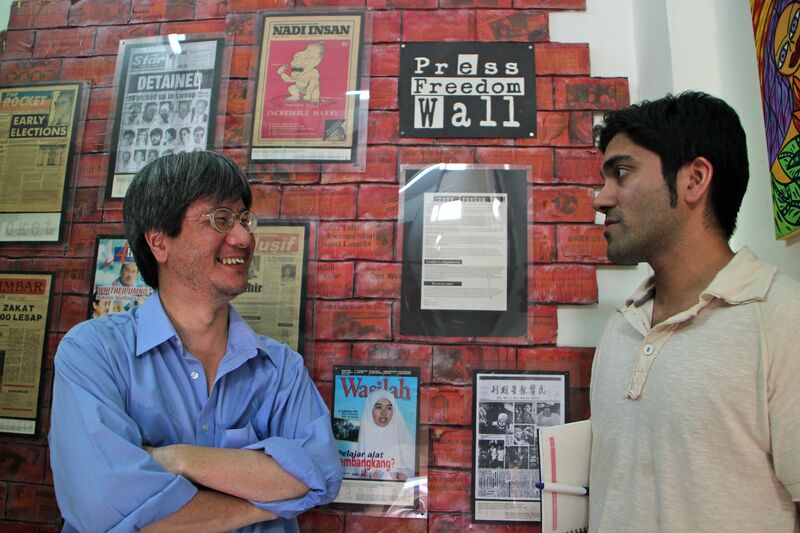 Here is a shot of Steven and I chatting in front of the Press Freedom Wall. As you might imagine, I find it quite interesting–if not altogether surprising–that this cover should have pride of place on Malaysiakini’s Press Freedom Wall. Going back to Leslie, of course, as a writer, I find it depressing that our government wants to lock up a fellow artist. Even more worrying to me is the number of Singaporeans who feel that Leslie is not a real artist, or that the Singapore government should be the one to decide what is legitimate art and what is not. Is Gilbert Goh an artist? Is the SDP website a series of works of art? As far as I can tell, he’s a political cartoonist. I believe that qualifies as art. If every artist who depicts politics or political scenes or imagery or metaphors is “a political actor” in your view, then sure, Leslie Chew is a political actor. Anyway, people do not have to agree on the definition of “art”. Really in the eyes of the beholder. And it’s certainly not the government’s place to decide.